Researchers Examine How The Flu Virus Spreads By Studying Students : Shots - Health News It's a particularly harsh flu season. In the close quarters of dorm rooms and cafeterias and study groups, the flu will come to college campuses. And when it does, one scientist will be ready. 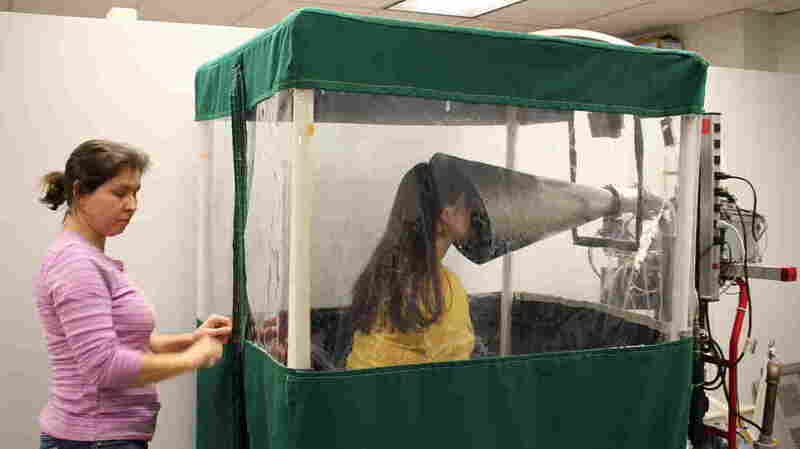 Undergraduate Shira Rubin gamely demonstrates the Gesundheit machine, which collects samples of virus from the breath that sick students exhale. Rubin helps Dr. Somayeh Youssefi (left) set up the machine before patients use it. Milton, a professor at the University of Maryland, College Park, is hoping dozens of students will enroll for the study, which will help him look at flu transmission. When one of them gets sick, the student will be sent to the clinic at the School of Public Health, just across the street from the dorms. 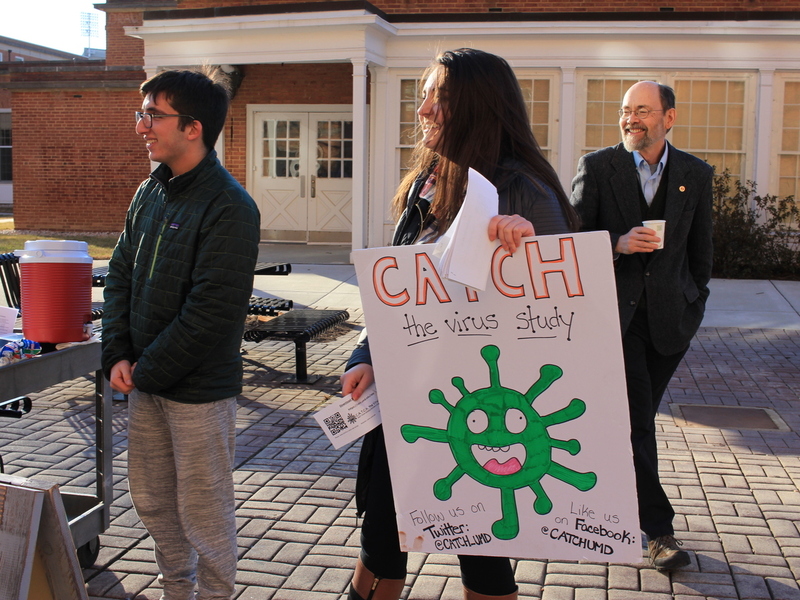 Louie Gold, Amara Fox and Dr. Don Milton recruit students to join the new virus study they're working on. One student does come by, but doesn't make the cut. "She had some of the right symptoms: cough, little bit of runny nose, but didn't have much of a fever," says Dr. Barbara Albert, who screens for the study. For half an hour, the student sits in the machine. As the student breathes, the machine collects whatever virus they've got from the droplets in their breath. The researchers will then use the student's contacts to try to figure out how infections spread from person to person: "roommates, study buddies, girlfriends and boyfriends," Milton says. "We're going to swab them every day for a week to see if they get infected." If the student's contacts get infected, researchers will try to pin down whether they got the bug from the original subject or someone else. "We're going to deep sequence the genetic code of the agent to see if it was really exactly the same thing," Milton explains. He's aware that confirming that your roommate gave you a horrible flu could ruin some perfectly nice relationships, but it's for science. The fact is, he says, researchers don't know that much about the mechanics of how bugs spread, so he's trying to understand it from every possible angle. "We're measuring the environment in the rooms, contact, biomarkers from blood, what they're shedding into the air," he says. All the data will also help people design spaces to keep infections from spreading too easily and protect ourselves more effectively. That's how he and his research staff can be around sick people all the time without getting infected themselves. They all got flu shots, and he installed a system that killed germs with ultraviolet light. During his last flu study, it worked. "Not a single person on my research team got the flu that year. Even though we saw 156 people, some of whom were shedding up to 10 million copies per half hour of the virus, none of my people got sick." He hopes environmental measures like these could be used to fight bugs that are even worse than the flu. "What about pandemics and what about new infections that come along? How can we defend against those?" Milton asks. "It is possible, even if it's airborne, to protect against it. We just need to understand how it works better." The information they get from this study could, for example, lead to better ventilation systems that would make it harder for the flu and even more dangerous viruses to spread. This story is part of a reporting partnership with NPR, local member stations and Kaiser Health News. Selena Simmons-Duffin is a producer at NPR's All Things Considered, currently on an exchange with Washington, D.C., member station WAMU.